The refresh of picture archiving and communications systems triggered by the end of national contracts is almost at an end. Trusts are now turning their attention to sharing images with different ‘ologies’, with different trusts and – shortly – other services, such as primary care. Kim Thomas reports on some of the different approaches that trusts are taking. Departmental technologies like PACS are changing and breaking free of their traditional roles, being redefined to respond to patient needs across the entire hospital, writes former NHS radiographer, Chris Scarisbrick, Sectra UK and Ireland. As more and more disciplines across the hospital need rapid access to imaging and information and as a growing number of diagnostic disciplines embark on their own digital journeys, the role of PACS is accelerating away from being solely departmental specific, to being one that must serve cross enterprise needs and flows of both information and images. 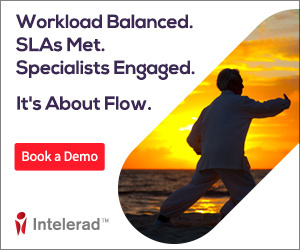 Intelerad UK is a leader in distributed radiology, specializing in PACS and cross-enterprise imaging solutions for hospitals, radiology groups, imaging centres, and teleradiology businesses. Renowned for their innovative features and functionality, Intelerad solutions increase productivity and streamline workflow by overcoming technical barriers in distributed and complex environments. Used in more than 1,000 sites across the United Kingdom, North America, and Oceania, Intelerad couples its highly scalable, flexible and robust solutions with industry-leading customer service and support to ensure customers' performance. Carestream Vue is a next-generation healthcare information technology that helps medical professionals remain at the forefront of radiology, achieving higher productivity and enhanced patient care. The Vue Clinical Collaboration Platform delivers complete, patient-centered views of clinical images and data across departments and sites. This supports dynamic collaboration between providers, patients, payers, administrators and IT managers, with tools and views tailored to each user's needs. The platform supports an advanced radiology diagnostic viewer and robust multi-media reporting with images and interactive hyperlinks - the type of report preferred by eight out of ten physicians. Continuing a lineage of imaging leadership and fuelled by a commitment to vanguard technology, Carestream Vue represents an advanced integration of imaging and information management. With thousands of proven implementations worldwide, this benchmark innovation streamlines workflow and supports clinical excellence. Agfa HealthCare helps hospitals and healthcare organisations deliver better care. We are a leading provider of a wide range of IT solutions and diagnostic imaging products, building on 100+ years of healthcare experience, 30 years as an NHS partner. Globally, we are a present in one out of two hospitals. We design, develop and deliver innovative systems for capturing, managing and processing diagnostic images and clinical information for hospitals and healthcare facilities. Our Enterprise Imaging Radiology Suite is a modern, single platform for PACS, reporting, 3D and clinical information for Radiology Departments. Designed for clinical productivity, facilitating quality outcomes and optimised total cost of ownership. Healthcare organisations worldwide are seeing the benefits from our innovations. Over 250 new Enterprise Imaging agreements across the globe have been obtained including the UK and Ireland, as hospitals see the benefits of a converged and integrated imaging platform approach. In addition Agfa HealthCare was recently named #1 Enterprise Imaging IT Vendor in the New Trends in Medical Imaging Technology Report. Next-generation healthcare IT leader Kanteron Systems has agreed to allow the NHS free access to Kanteron's medical imaging and genomic data integration platform, under the custodianship of an NHS clinically-led community in the Apperta Foundation. Kanteron Systems' integrated platform allows doctors to connect existing information silos like radiology images and studies, pathology WSI and reports, genomic sequences, pharmacogenomic databases, and biosensor data, in a single point of access. The platform, which runs on Azure or on-prem, is being used in 15 countries for many purposes, like adverse medication event prevention, pre-operative genomic screening, medical trial cohort selection, or establishing telemedicine networks. This agreement will also allow the NHS to enhance the platform with new software components. Kanteron Systems will provide implementation, integration, and support services through certified partners, like Microsoft Azure, Hitachi, IBM, and CGI.